Here's a customer's nice little 14" scale banjo uke with fancy pearloid fretboard and headstock. 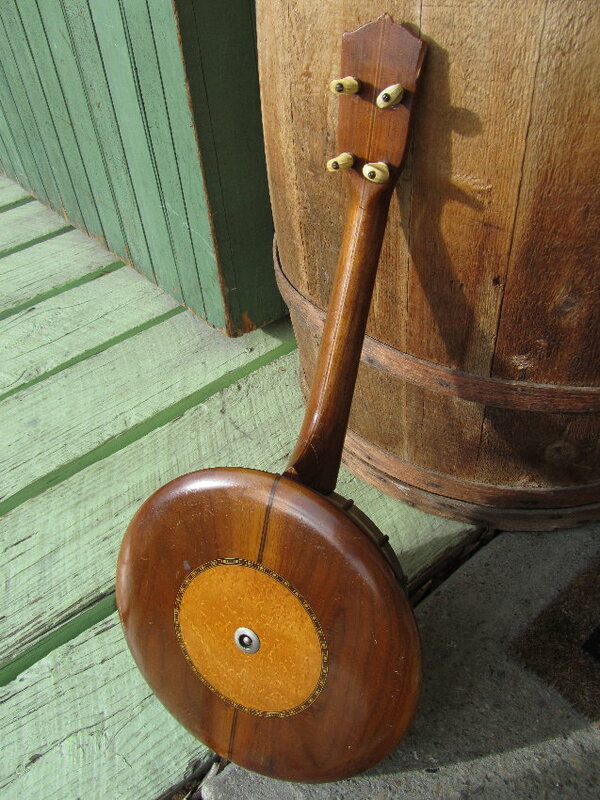 It's also got a mahogany 3-piece neck, mahogany pot with inlaid marquetry, and inlaid mahogany resonator. I was asked to set it up and that's what I've done... plays great and easy, sounds snappy and loud with good definition of notes (expected with a slightly longer scale) and has a lot of projection. This was built by Kay in Chicago in the late 20s or early 30s. Before 1931 (I think it was?) they were known by "Stromberg Voisinet." Original skin head... crudely patched at some point, but still holding on. 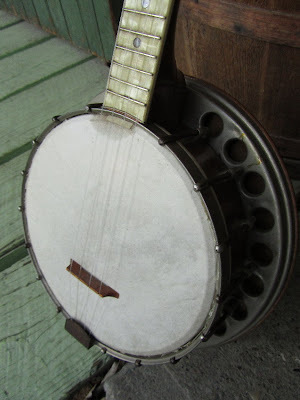 This uke is all original. 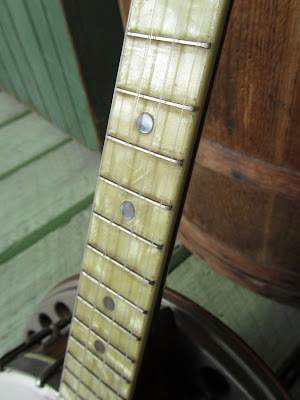 Fun fretboard, and bound, too! 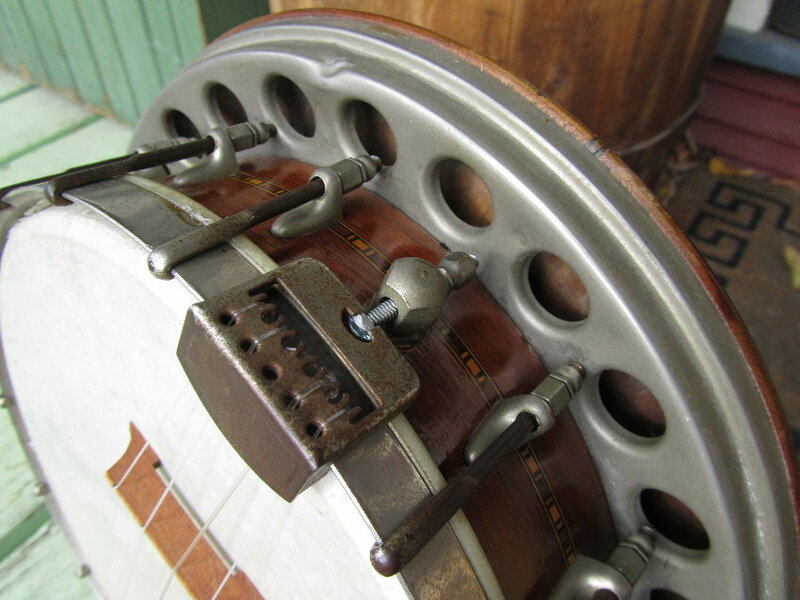 Really pretty resonator and woods on this uke. Ah, misspoke... this is a 5-piece neck -- mahogany/maple/rosewood/maple/mahogany. Classier upscaled Grover "Champion" uke pegs. 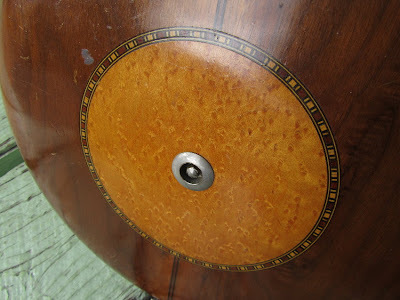 Nice bit of birdseye veneer on this one. 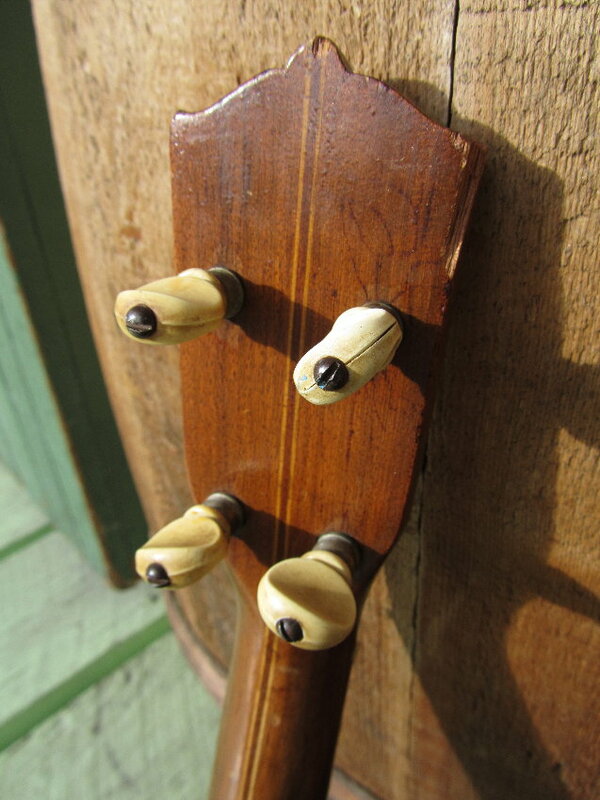 It's pretty great that this uke still has all its hardware. 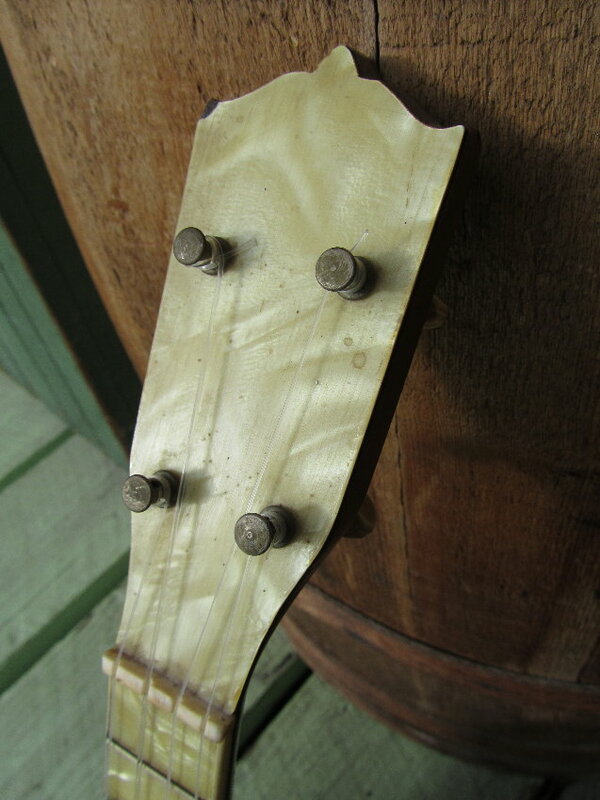 Note that the neck was broken and repaired (crudely) at some point in the past. 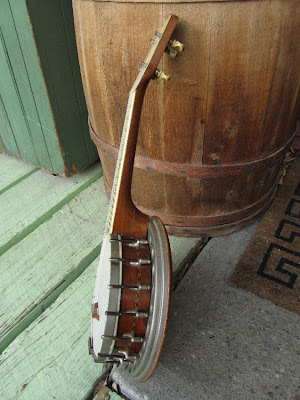 Not a fan of this tailpiece style, but it is practical. 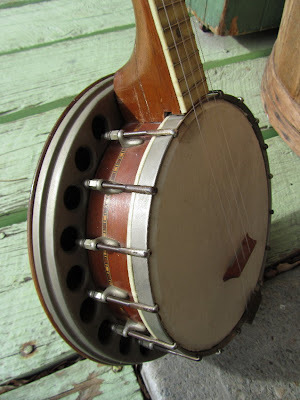 Stromberg banjo ukes often had a small brass tone ring set in the outer edge of the rim/pot. On my SV banjo ukes the brass was not solid and it improves the sound to replace it with solid brass and a slightly larger diameter. 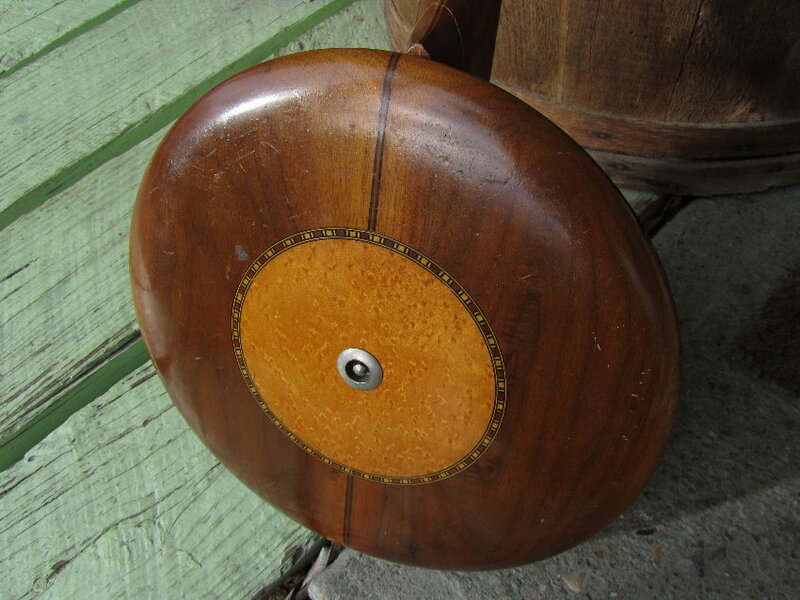 I have restored a few that had no tone ring, and added them by placing them near the inner edge of the pot. 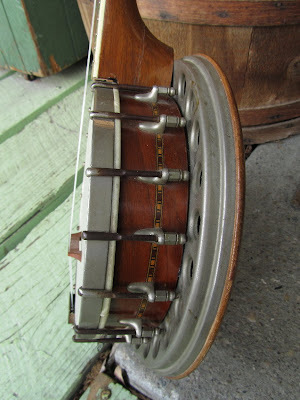 This gives them a punchier less muddy sound. 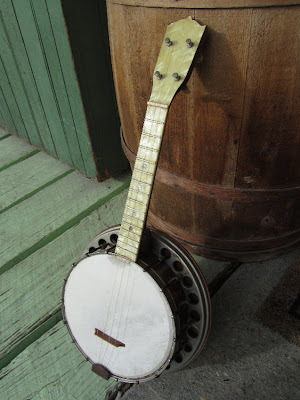 The Stromberg Co. predated Kay and rarely put their mark on any instruments. The Kay banjo ukes remained to have the basic lines of an Stromberg Voisinet but used less hooks and dropped the peghead design. For how much would one those sell? What if it were all original, no repairs?